About Us Discover The Quality Dental Care You Deserve! At Yellowstone Family Dental, our patients are the priority. Whether you’re receiving a personalized treatment plan from one of our expert dentists or you’re simply scheduling an appointment with our friendly office staff, you’re sure to receive exceptional care. 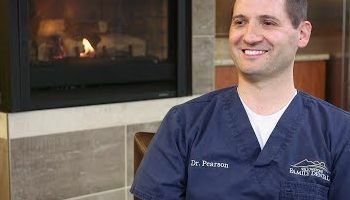 Doctor Chase Pearson on Yellowstone Family Dental's office philosophy We believe in offering our patients a Billings, MT dentist experience that relies on trust and comfort, not judgment and sales. If you’re looking for a dental office that will listen to your concerns and meet your needs, look no further than the corner of North 27th Street and 11th Ave. North! Take advantage of our many amenities, from private operatories and TVs above each chair to free consultations and second opinions. Our goal is to give you an experience free of any dental anxiety so that you’ll continue to have a happy, healthy smile. Call us at 406-206-9889 to schedule your appointment today. Content: You don’t have to sacrifice quality for convenience. Instead, get all-in-one care from our experts. Our doctors have the training and experience to provide comprehensive dental care right in our office. See us for your biannual dental cleanings and exams or other general dentistry needs like nonsurgical gum disease treatment. We’ll help keep your gums and teeth healthy. Repair and restore damaged or missing teeth with same-day crowns. Using CEREC technology, we can custom-create a porcelain or zirconia prosthetic just for your smile. Get the quality family dentistry your loved ones deserve. We have a special area for children and offer care for smiles of all ages. Give yourself the smile of your dreams with our cosmetic dentistry options. Choose one or any combination of treatments to bring out the natural beauty of your smile! Have your dental implants placed and restored all in one location. Dr. Matthew Larsen can provide you continuous care from root to crown! Get world-class dental care with a small-town feel from Yellowstone Family Dental. Call us today at 406-206-9889 to schedule your appointment. Not sure if we accept your insurance? Take a look at the list below or simply call us to verify.